Read Chapter Two of Inner Christianity about the World and the Fall. Copy and paste the questions below to a new e-mail, insert your answers and send to the Mystery School with the following subject line: InnerChris 2 from ___________ (Your name). 1. What are some of the interpretations of the entity known as the "world"? 2. In esoteric Christianity, the part that is experienced is called the ________. 3. The "I" is known as __________. The world is known as _________. 4. T/F One of the central teachings of esoteric Christianity is that the "I" is not the ordinary self (or ego). 5. A closer reading of the ____________ account suggests that the _______________ man and woman were not ____________ but _________ what they __________-direct experience of good and evil. 6. What does inner Christianity teach about the Fall? 7. T/F Inner Christianity teaches that Eden was a real place on earth. 8. What do the two types of covering used by Adam and Eve represent? 9. What does the tree symbolize? 10. Adam, in esoteric Christianity, refers to a sense of _____________, ___________, and _____________ to the world. 11. The Fall is not so much a matter of _______________ ____________ or ____________ ___________ but a ___________ that the human race has made as a whole to ________ good and evil through the experience of the __________. 12. What is the ouroboros, and what does it symbolize? 13. T/F Humans ultimately remain superior to the constraints of time. 14. In the fallen realm, life is not ___________ but _____________. 15. 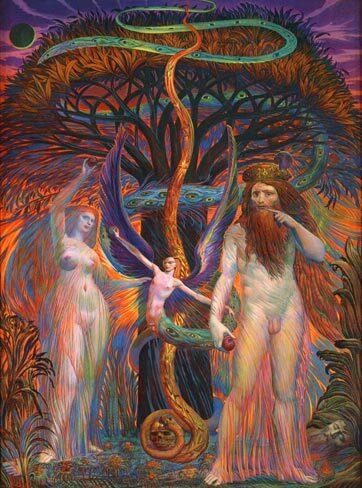 What are the two main esoteric Christian interpretations of the archetype of the serpent? Exercise: Do the meditation described on pages 50-51. Could you recognize the "I"? Make a brief note of anything else you saw or learned. Essay: Do you believe it's possible to believe in a creator god and the mechanism of evolution at the same time? No right or wrong answer here--just support your beliefs!